"Co-authoring a field guide to nature requires not only prior knowledge but also lots of research. It is not sufficient to rest on past experience nor rely on previous adventures. 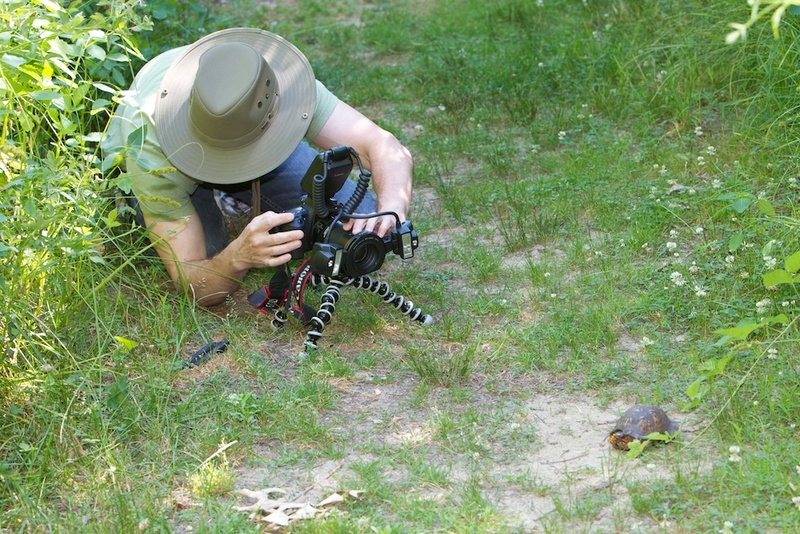 Since the KFG series is crafted to be welcoming to the novice naturalist, you must attempt to view the world through the eyes of those who have yet to develop a keener awareness of the natural world. To do that, you must get out in the field and visit places that are likely to be visited — or could be visited — by your target audience." 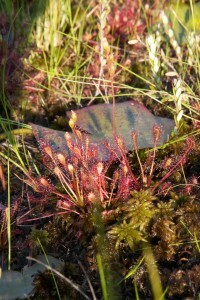 In my previous two blog articles I shared with you another side of me — that of naturalist and ecologist. What I did not share at the time was that I was embarking on a new short-term two-year project. This post describes that project in detail. I’m Co-authoring a Field Guide! What is this secret project I have embarked upon? I’m co-authoring a field guide with the respected, and respectable, naturalist Kenn Kaufman. For those of you who do not know of Kenn, here is a brief biography of his life and work. My wife April and I have had the privilege of knowing Kenn Kaufman for almost 18 years since we first met him at a birding and nature conference in Sierra Vista, Arizona in 1995. Besides a lifelong intrigue with the natural world, I quickly found out that I shared another commonality with Kenn — we were both originally from South Bend, Indiana. This past spring, during The Biggest Week in American Birding festival — an annual celebration of bird migration and nature — Kenn approached me with a proposal. He was interested in having me as his co-author on the next book in his acclaimed Kaufman Field Guide Series. My primary responsibilities would be the botanical sections of the book. As this would be a big responsibility and would require a big time commitment on my part, I spent five days seriously weighing the pros and cons of Kenn’s offer. As much as I needed to remain focused on my InterWeb startup, this project was captivatingly enticing. In the end, the decision was clear. This was an opportunity I could not decline. 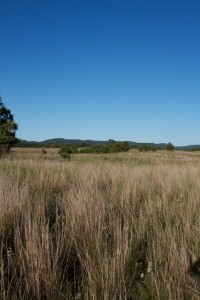 With my years of experience as a restoration ecologist, my time at JFNew running their native plant nursery, my love of botany, and my hands-on time caring for and studying the more than 400 species of native plants that we had planted on our acre-and-a-half piece of land, this project was a perfect fit. 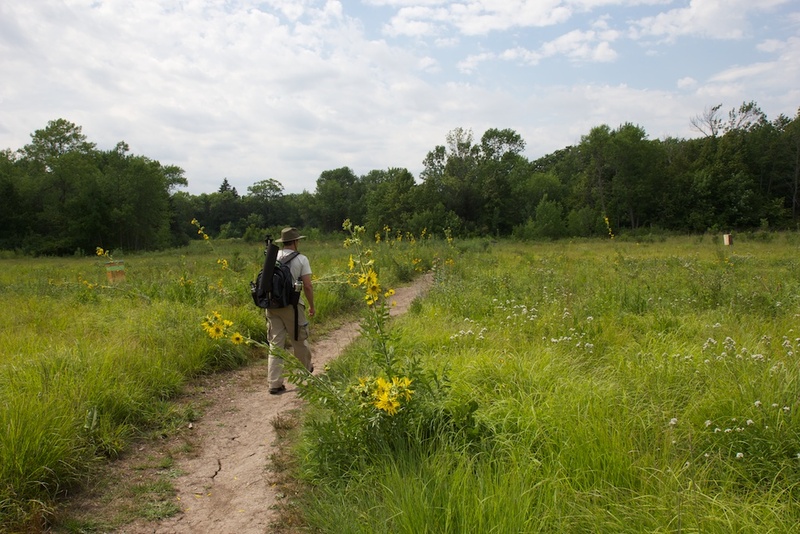 My decision process required considerable soul searching and resulted in two long blog articles: The Wilder Side of Me and A Migration Celebration. 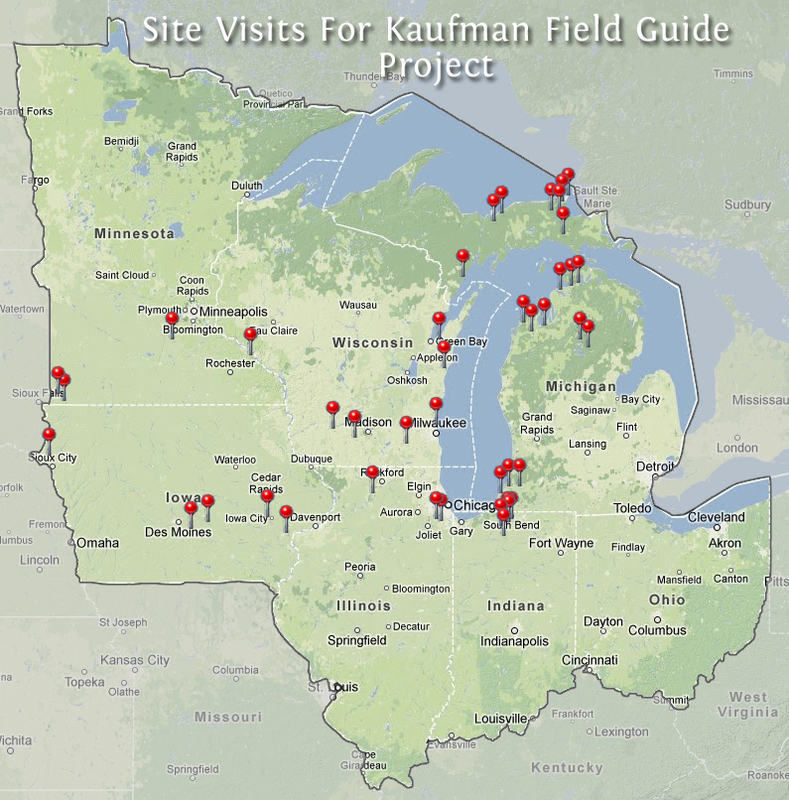 The Kaufman Field Guide (KFG) Series is an important body of work. Whereas there are a number of other worthy nature field guide series currently in print, Kenn’s series is built around the simple yet hard-to-actualize concept of crafting expert guides that are accessible to beginners. In my opinion the KFG series has accomplished that difficult task with an elegant brilliance. The book I am co-authoring will be entitled, Kaufman Field Guide to Nature of the Midwest. I am primarily responsible for the botanical sections but will also be providing assistance in a number of other ways with the project. This book will be the second in KFG’s regional guides. The first in the regional series, Kaufman Field Guide to Nature of New England, will be released this October on the 16th — in three short weeks! Co-authoring a field guide to nature requires not only prior knowledge but also lots of research. It is not sufficient to rest on past experience nor rely on previous adventures. Since the KFG series is crafted to be welcoming to the novice naturalist, you must attempt to view the world through the eyes of those who have yet to develop a keener awareness of the natural world. To do that, you must get out in the field and visit places that are likely to be visited — or could be visited — by your target audience. From the moment I agreed to share a co-author spot with Kenn, I jumped into this project with both feet. It was not going to be acceptable to spend some time in the field. 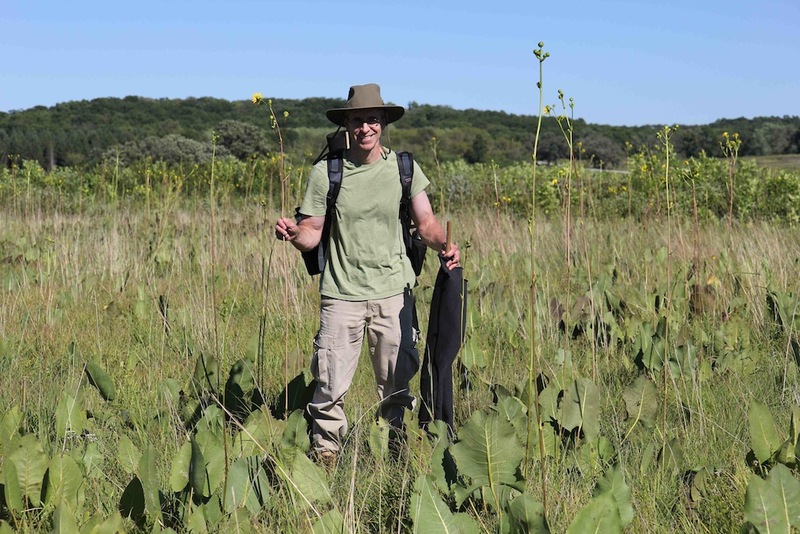 Instead, I knew I was going to spend a lot of time in the field — field time is what naturalists, ecologists, birders, botanists, environmental researchers, etcetera call time spent outdoors in habitats suited to their line of study. 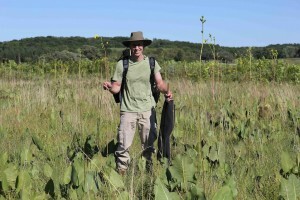 Jeff stands in an old-growth field of Prairie Dock Plants (Silphium terebinthinaceum). With North America experiencing a record warm and dry spring and summer, it has been a challenging field season to say the least. 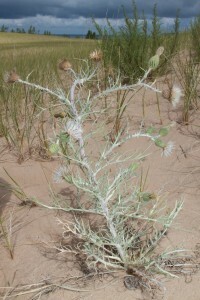 Capturing target species often required visiting multiple locations to find a specimen that was in healthy-enough condition to photograph. On the other hand, we were amazed by the resiliency of some species to thrive in seemingly impossible conditions. 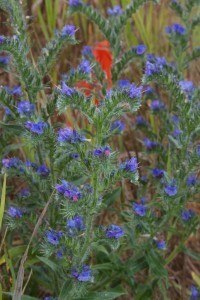 Our efforts to get out in the field, even on the hottest and driest of weeks, were often rewarded with great finds. The time April and I have spent in the field over the past four months has been nothing short of amazing. We visited numerous places throughout six Midwestern states taking notes, photos, and simply reveling in the breathtaking species richness, unique geology, and stories of the many local, state, and national parks that we visited. Although I am co-authoring the book with Kenn, it has been a wonderful experience to spend so much time in the field with April. Nature is a core interest that brought us together almost twenty-five years ago. April is a very successful children’s book author focused on science and natural history. Our travels this field season will surely inspire her to pen another award-winning children’s book or two! Part of the task I have assigned myself with this project is to photograph as many plant species in high-definition detail as possible. Next field season, in addition to revisiting a number of places, we will be covering the remaining areas of our territory to capture additional species. We will be visiting upper Minnesota and Wisconsin, all of Ohio, lower Illinois and Indiana, and the eastern half of the lower peninsula of Michigan. The map to the right shows the places we visited this field season. In our travels we have experienced some ecological jewels and have been awestruck by the beauty and resiliency of these ancient ecological marvels. Treading on virgin pieces of habitat — land that has neither seen nor felt the destructive forces of humankind (well, minus global climate change) — it is hard not to be moved. 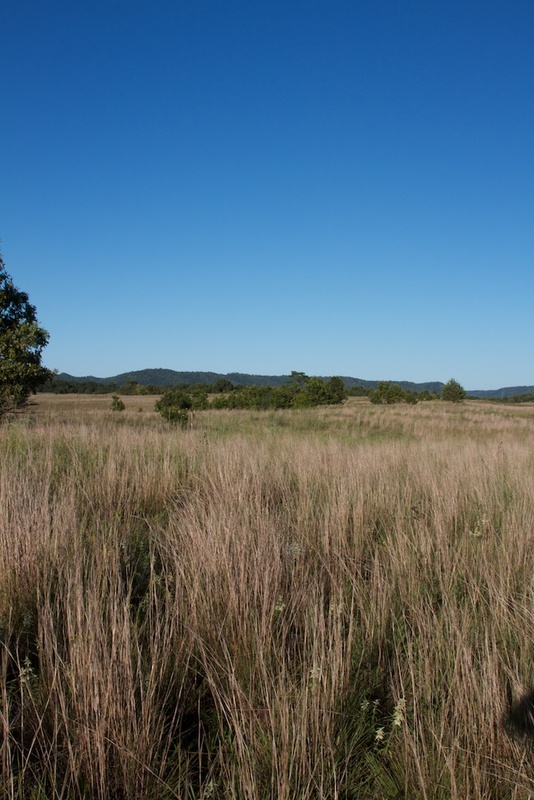 Whereas we’re fortunate to have had the opportunity to experience nearly pristine habitats, we also have many fond memories from our visits on lands that have not be as fortunate to escape the plow, bulldozer, or poison. There is always a gem to be found if you know where to look. 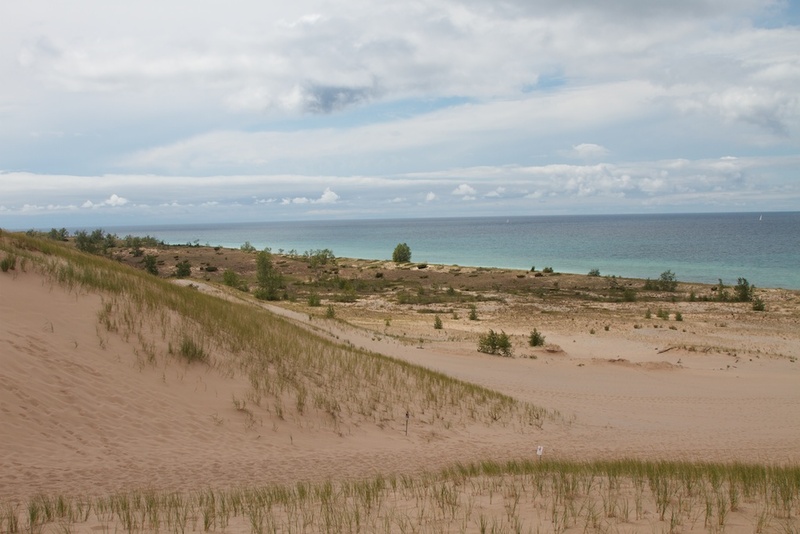 Many local and state parks and private preserves are working hard to reclaim and restore the land. We were honored to have met and been guided by a number of stewards who are the true heroes in the fight to preserve and return nature to its former grandeur. 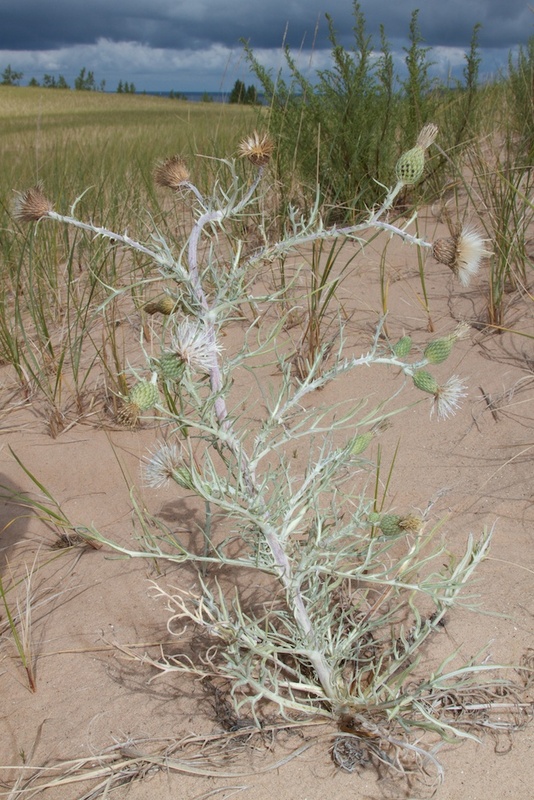 The Federally threatened Pitcher’s Thistle (Cirsium pitcheri) blooming on a Michigan dunescape. 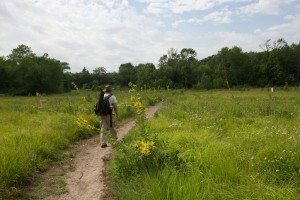 Jeff walks a very-dry trail at Schlitz Audubon Nature Center near Milwaukee, Wisconsin. iPhone photo of Jeff’s forty-pound photo pack. 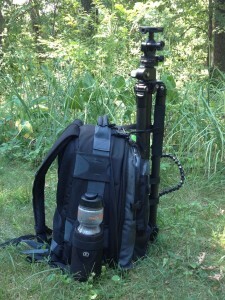 Try carrying that for ten hours each day in 100 degree heat up and down dune trails, into bogs, or through chest-high prairies. 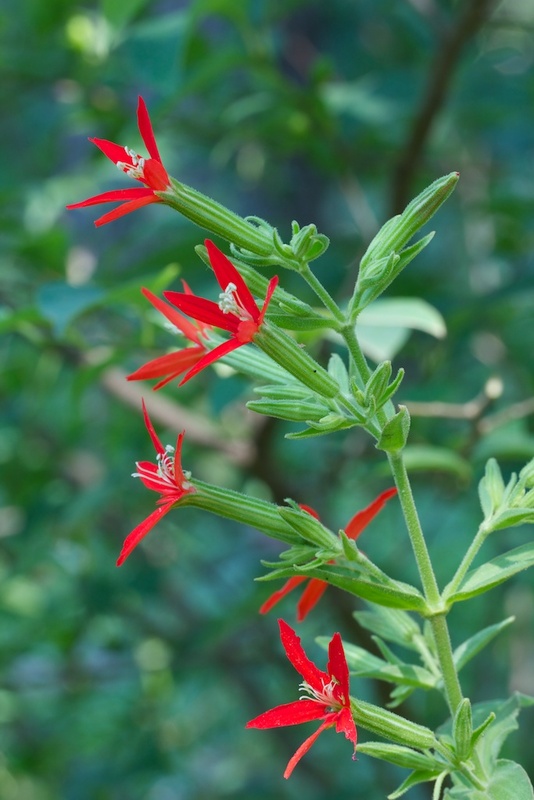 A rare plant that is considered endangered or threatened in Illinois and Indiana, the Royal Catchfly (Silene regia) is stunning when in full bloom. Why is it named catchfly? 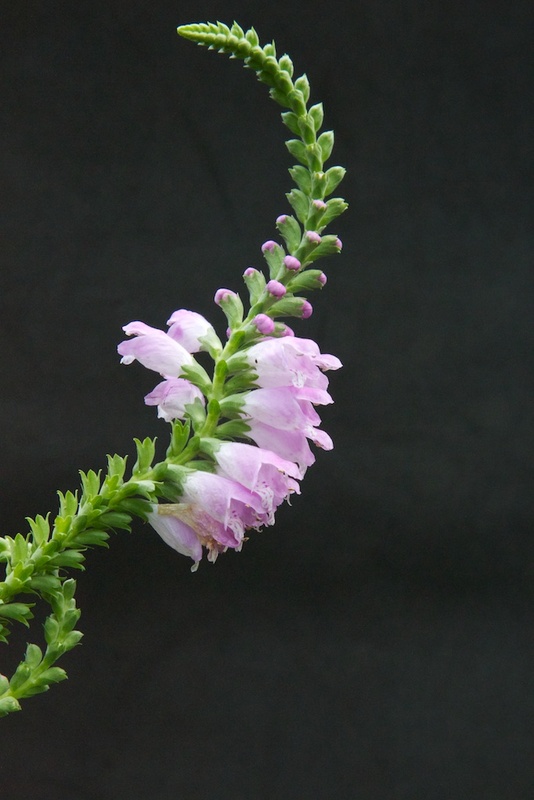 The calyx of each flower is covered with glandular hairs that exude a sticky substance. 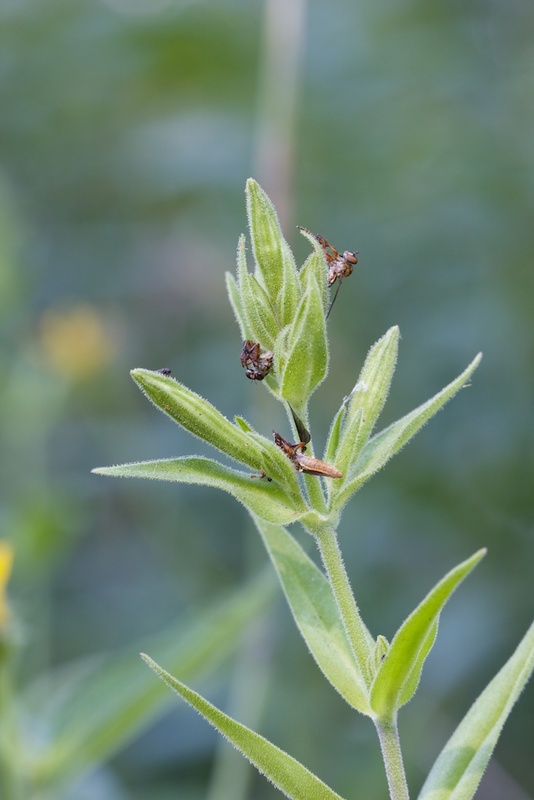 Small insects that land on this part of the plant often get trapped. Here yet-to-open flowers of a Royal Catchfly (Silene regia) demonstrate the reason for the name. 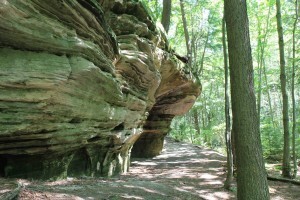 A beautiful eroded limestone rock formation within the forest of Picture Rocks National Lakeshore in Michigan’s Upper Peninsula. 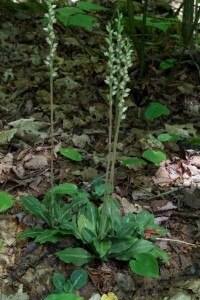 An unusual orchid, Green-leaved Rattlesnake Plantain (Goodyera oblongifolia), in full bloom deep within the forests of Pictured Rocks National Lakeshore. 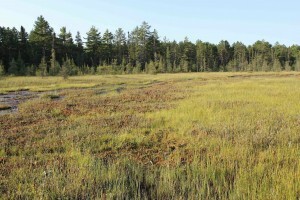 Clark Lake Bog in Tahquamenon State Park in the UP of Michigan. 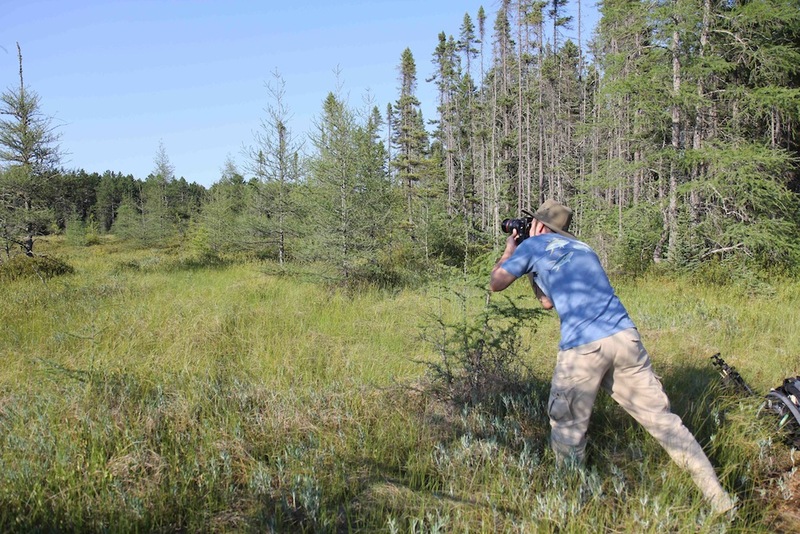 Jeff carefully steps out on to the fragile — and potentially deadly — bog mat near Clark Lake Bog to photograph the scene. 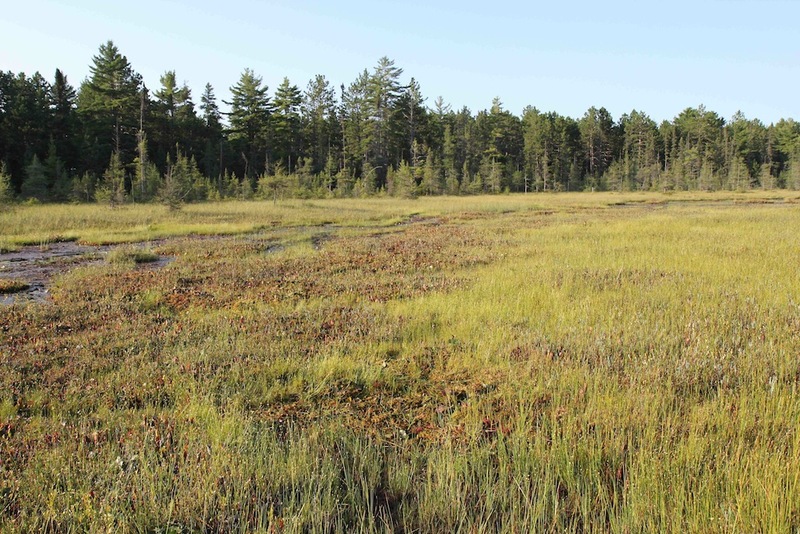 The area is punctuated with Tamarack trees (Larix laricina), a species closely associated with acidic bogs. 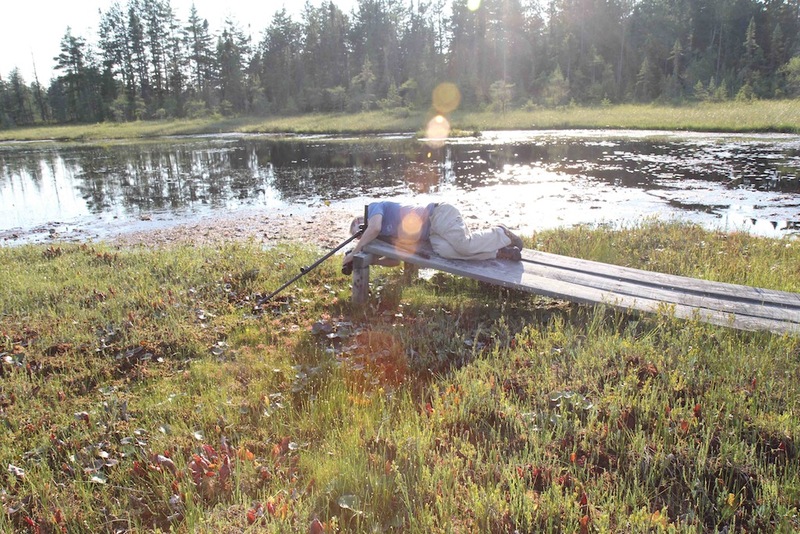 Jeff carefully positions himself and his tripod on a tenuous platform jutting out into Clark Lake Bog. What is he attempting to photograph? See the next image. Success! I captured this other-worldly image of the small, carnivorous Spatulate-leaved Sundew (Drosera intermedia) as the sun began to set. 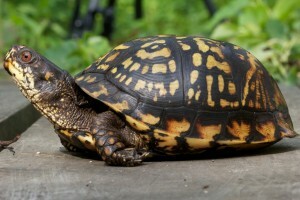 A macro shot of a beautiful Eastern Box Turtle (Terrapene carolina carolina). Am amazing Hummingbird Clearwing Moth (Hemaris thysbe) pollinating a Prairie Monarda (Monarda fistulosa). 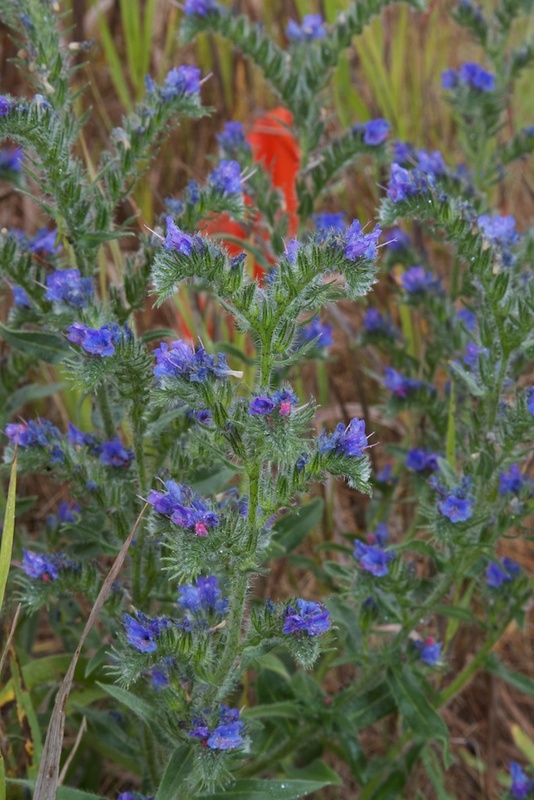 Viper’s Bugloss (Echium vulgare), also known as Blueweed, is an attractive non-native plant that can be found on roadsides and waste places of limestone regions. The individual flowers on the floral spike of the aptly-named Obedient Plant (Physostegia virginiana) will remain for a time in whatever position they are moved. Count the deer flies. We were bitten by numerous deer flies and uncountable mosquitoes during our time in the field. How many deer flies do you see swarming around Jeff? At least 21. It’s all about timing. 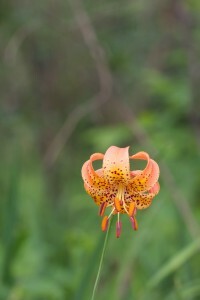 We returned to this particular spot four times just to get this picture of a Michigan Lily (Lilium michiganense). This field guide project has provided me with the opportunity to reconnect to the natural world in a way that I had been missing for some time. In retrospect, had I not accepted this project, I believe that the work I do in the world of technology would not be as meaningful to me going forward. Besides providing me with an excuse (did I really need one) to spend more time out in nature, out in the field, this project enabled me to unplug from the metaverse, to hit the reset button and reevaluate what is truly important. It had become too apparent that I was spending more and more time in the metaverse, posting and chatting on various social channels in ways that truly did not prove useful to me nor my startup. Although I claimed it was of little relevance to me, I did actually care about my social metrics — number of Twitter and G+ followers, my Klout score, etc. Whereas putting more time into the metaverse did maintain and sometimes increase my overall social metric rankings, the reality was that time spent in the metaspace did very little to improve my existence in the physical world. Breaking free of the shallow and often hollow trappings of the metaverse has allowed me to reassess what is truly important. In the metaverse, there seem to always be an unlimited number of opportunities with which to get involved — open source projects, other startups, W3C groups, lengthy Google Plus threads. But few if any of these pursuits helped pay my bills nor did they result in long-term, meaningful work. At first it was hard to unplug from the artificial and reinsert myself into the physical world. But after a week of immersive nature therapy, key synapses began to restrengthen. An important and essential core of my life began to reawaken. I have made many friends in the metaspace and do strongly believe in the worth of open source and W3C groups. However, my involvement in various initiatives did not help my startup move anywhere closer to launch. If anything, it distracted me from my efforts. You may be thinking that taking on the duties and responsibilities of co-authoring a field guide is an even greater hindrance to launching my startup. In a sense, that is true. However, as stated above, this project has rescued me from a deep dive into the metaverse. For that alone I am thankful. Much of my writings about the Social Web and the Future of Humankind are rooted in my understanding and appreciation of the natural world and in particular ecology. However, I had become so immersed in the metaverse that I was spending fewer and fewer hours each week within nature and had reduced my time working on my startup. Instead, I was lost in conversations and thought. 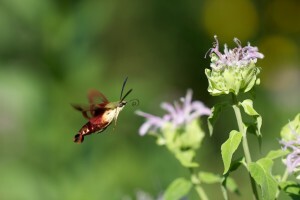 Although I would take breaks to walk in our native plant gardens, to go birding during migration, or to watch an occasional nature documentary, I was not tuned into the patterns of nature, I did not feel part of the natural world. Have I Given Up On The Social Web? Whereas I have not been working full-time on my current startup nor spending hardly any time on Twitter, Google Plus, or even on W3C committee work, as this field season comes to a close, I will be refocusing more of my efforts in these areas once again. Of course I will be putting in more field time next spring and summer and will be working on the field guide this winter — writing, photo sorting and editing, and range map creating. With a very successful field season completed this year, and the reintegration of a core piece of myself, I feel confident that I can now juggle two disparate jobs — that of smartup entrepreneur and that of field guide author. Coming in 2014 Spring 2015! Do you live in the Midwest, plan to visit the Midwest, or have friends or family that live in the Midwest? 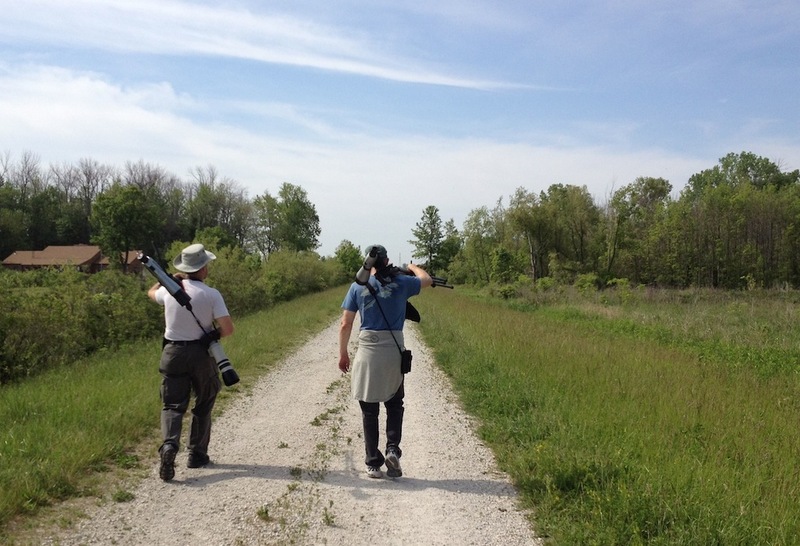 If so, look for my Kaufman Field Guide to Nature of the Midwest book to come out some time in 2014 spring 2015. I’ll keep you posted on a more precise release date. 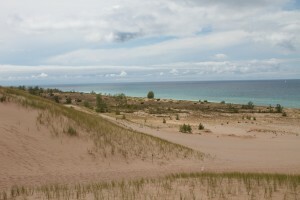 A wondrous high-quality sand terraced dunal habitat on the western shores of the Mississippi River, Weaver Dunes Scientific and Natural Area is protected thanks to The Nature Conservancy of Minnesota. E. O. Wilson says that, “Nature holds the key to our aesthetic, intellectual, cognitive and even spiritual satisfaction.” I have known this to be true for decades. But nature also holds the keys to our species future, keys that can only be utilized if we take the time to truly comprehend the marvel that is the Web of Life. While you eagerly await the publication of my latest tome, I encourage you to step back a little from the metaverse and reengage and immerse yourself in the physical world. Take a walk at a local park during a lunch break, visit a state park this weekend, or just spend time in your yard or on your porch watching the marvels of nature. As our society accelerates toward increasingly complex technologies, let’s not forget the foundation upon which our lives and livelihoods depend — the natural world. Congratulations on the new project, Jeff! It’s always a pleasure to hear about the parts of my internet friends’ lives that are inherently non-internet. And the pictures of you taking pictures make me think that the photography in the field guide is going to be very special indeed! 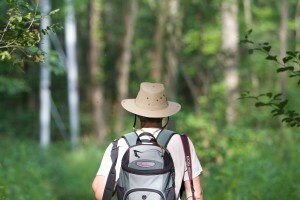 Thank you for sharing your perspective on nature and outdoor experiences. I too have been spending too much time in the metaverse and your words remind me, and I am sure others, to get out and away more often. Welcome back to the physical world Jeff- I look forward to your book! Hi, Jen! Thank you for the comment. The book will be released April 21, 2015. It is already listed on Amazon.